This review originally appeared in The Portland Mercury. Finnish director Aki Kaurismäki’s Le Havre is named for the French coastal town where it’s set. Huge metal containers pass through this port on their way to somewhere else. One such container is full of African refugees. When the door is cracked, a young boy (Blondin Miguel) makes a run for it. Stranded, he ends up hiding with Marcel (André Wilms), a harmless scoundrel known for his love of the vino. Marcel's wife has recently taken ill (Kati Outinen), and getting the kid to England gives the old man something to do while she’s in the hospital. Le Havre has a quaint European affectation that’s both charming and inconsequential. The quirky small town pulls together to help Marcel, and they hold a benefit rock concert to pay off smugglers. Even the police turn a blind eye. The inspector in charge of the case (Jean-Pierre Darroussin) would rather be solving real crimes than chasing harmless immigrants. Darroussin is one of the film’s bright spots. With his smart patter, bowler hat, and moustache, he’s like an extra from Tintin [review]. 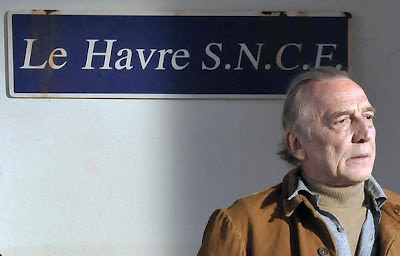 Only Marcel's cranky neighbor, played by former wunderkind Jean-Pierre Léaud (The 400 Blows) goes against the community, though his snitching serves little function beyond instigating Le Havre’s third act. By that time, the outcome of this little plot is never less than a foregone conclusion, a fact underlined by Timo Salminen’s melodramatic score in the final scenes. 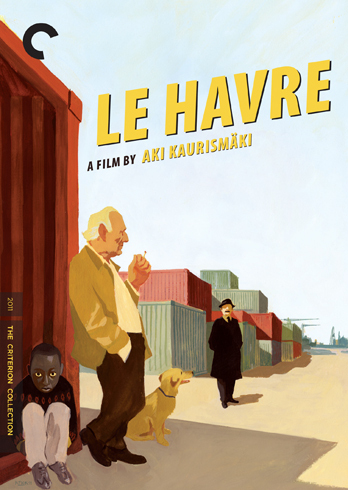 It’s blandly enjoyable, but really, Le Havre is just old-school Hollywood cheese filtered through a semi-ironic lens. Kaurismäki (Leningrad Cowboys Go America [review]) has been peddling this same middling tone for several decades now. He’s like a Euro Woody Allen, dependable and occasionally surprising, but also somewhat dated. 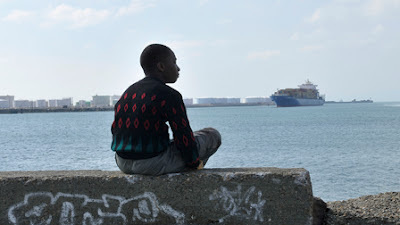 Le Havre feels like a leftover from an international film festival circa 1994.